Non-farm payrolls are due for release on Friday and there is a very strong chance that job losses were less than 600k. I am going to be doing a thorough preview of NFPs later this week, but here is one of the PRIMARY reasons why payrolls could beat expectations. The employment component of service sector ISM has a very strong correlation (see chart) with non-farm payrolls. 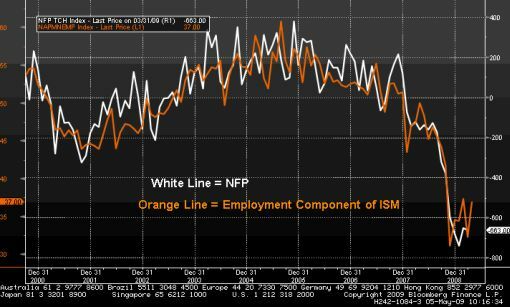 I show this chart every month and it has been reliable leading indicator for NFPs. The employment component rose from 32.3 to 37.0. The last time we had a similar rise was in Feb, when non-farm payrolls printed 90k less than the previous month. The market current expects job losses of -610k.